What do fruit cake and family holiday letters have in common? The fact that some people love them and others, possibly a majority, hate them! I happen to be a fan of both. A Christmas card with nothing inside strikes me as a tragic waste of a stamp and a lost chance to communicate. As for fruit cake – well, lest I descend into lecture, here is our annual holiday missive. Happy Holidays! Here’s our effort to recap some of our 2016 adventures. We kicked the year off in March as we flew to Los Gatos to celebrate our 44th wedding anniversary with Dorine and Dorje and grandson Arthur, as well as the Lewis family. In April David went and purchased – a new motorcycle! 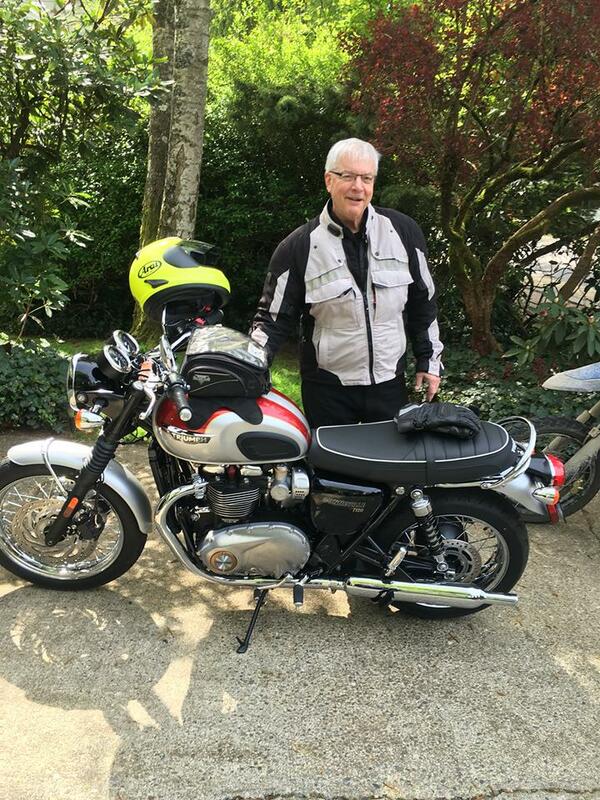 The Triumph Bonneville T120 is his first new bike in ten years, and quite magnificent. He also published Farrier Ride, his 8th book, 5th novel, and 4th in the “Harrison Thomas” mystery series. June was great fun. First up was Will’s graduation from the U of W with a BS degree in science ecology. Wow! Then Susan took off for Los Gatos to spend a weekend with grandson Arthur. July got hectic. First David was the driver for a team that entered the “Gambler 500,” a hilarious adventure of a two day rally on non-paved roads in Oregon, in a $500 car. Both the car and David survived. The next week Susan was off to California again, and David followed her a day later on his motorcycle. He had many adventures, including getting lost a few times, a broken attachment for his helmet visor, and staying at a motel that had just been the scene of a murder! In between those events, Susan had a romp to Santa Barbara featuring an afternoon of sailing with sister Meghan and nephew Sam, and then Susan and David enjoyed playing with grandson Arthur and attending his swimming lessons in Los Gatos. August began with the Riders for Health Scavenger Hunt V, a fun weekend with close friends raising money for health care infrastructure support in Africa. David amasses the door prizes for this event, and had a fantastic time. Alas, Susan was left with a crisis, as The Dorine fell and broke a rib in her back, and then fell again and broke her hip and wrist. David came home and joined the family in crisis mode, trading off nights and days in the hospital. Virtually all of the family rallied to Dorine’s side, as well as neighbors and friends, and in the few days she had left she had the chance to chat and say farewell to so many. After she passed in peace the family continued to pull together to plan the funeral mass and a celebration of her complete and fulfilling life. The entire extended family appreciated the love and support of so many. Then, on to the task of sorting through almost 50 years of accumulated possessions, pictures, memories, and such. Painful, but inspiring to see her children and grandchildren working so hard and so well together. As life began to return to sort of normal in September, Susan was off to Los Gatos and then on to Davis, helping Dorine and family move to a new home and job for Dorje at UC Davis. Exciting! Meanwhile, David was engaged in a several month science experiment to work on issues with his back and right leg and knee. After an MRI on his head (as we suspected, there was nothing there) and his lower back, several visits to all sorts of specialists, and a lot of PT, he is coming along.